Sometimes the best smile makeover doesn’t involve veneers, braces or tooth recontouring. If your smile is healthy, but you’re looking for a way to refresh it that’s fast and effective, professional teeth whitening may be the best decision! At 7 Pearls Dental we’ve been using ZOOM® teeth whitening products for over five years; they’re our product of choice for our patients, because of just how well they work. Take advantage of our 25% Off Teeth Whitening offer today! Cost $450 which is 25% off original price and includes a free take home kit for longer lasting results worth $250. Otherwise the take home kit by itself is a ZOOM take home kit and is $250. Sometimes the only thing you need to help your smile look its best is brightening the colour of your tooth enamel. Teeth that are already healthy and properly aligned can still look dramatically different after a professional ZOOM teeth whitening session. We encourage our smile makeover patients to whiten their teeth before planning any other cosmetic treatments. 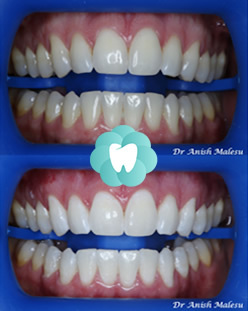 This step allows us to match new restorations (such as veneers or porcelain crowns) to the lighter shade next to them. Dental porcelains and materials cannot be made whiter later on. It’s impossible to go back and whiten your new dental restorations after they’ve been placed, so it’s best to have a brighter baseline from the beginning. 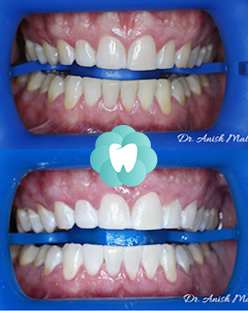 Before starting any type of teeth whitening treatment, we’ll need to evaluate the health of your teeth and gums. If you have active tooth decay or periodontal disease, your whitening procedure may need to be delayed until those infections are properly managed. Otherwise, whitening could lead to pain or potential nerve damage. We’ll also want to discuss your lifestyle habits, diet and reasons for pursuing teeth whitening, as ZOOM may not treat specific issues. If another alternative is a better solution for your concerns, we will make appropriate recommendations. For best results, schedule your teeth whitening treatment shortly after your most recent scale and clean. If you prefer, we can arrange to start your treatment immediately after your next checkup. Depending on the colour of your teeth, we offer three whitening intensities, ranging from gentle to high. Using ZOOM’s 22% peroxide concentration gel, we apply it directly to your teeth after a liquid dam has been coated onto all of your adjacent gum tissues. A bright light accelerates the stain-release process while you sit back and relax for 15 minutes. We repeat this cycle 3-4 more times, with fresh gel being reapplied each time. We encourage you to use sensitivity toothpaste for 1-2 weeks leading up to your appointment. A tooth mousse may also be prescribed, to alleviate potential sensitivity during your treatment. If you become sensitive at any time during your ZOOM procedure, let us know. After your ZOOM treatment, take care to avoid tobacco products, dark liquids such as coffee or soda and foods that may stain your teeth, including tomato products or berries. Just remember, anything that can stain a white shirt, can stain your teeth. Proper toothbrushing, frequently rinsing with water and periodic touch-ups can help you extend your results for as long as possible. We offer complimentary 30-minute smile makeover consultations for all prospective cosmetic patients. Contact us today to schedule!